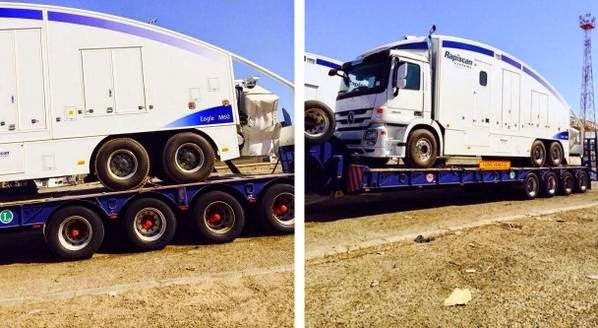 Images emerged on social media 08NOV14 depict initial batch of Rapiscan Eagle M60 Mobile Cargo Inspection System vehicles delivered to Iraq. Eagle M60 type seen above transiting Iraq appear based on the Mercedes-Benz Actros platform. Last June, OSI was awarded a $102.5 million U.S. Department of Defense foreign military sales contract to provide X-ray imaging systems and contractor logistics support to Iraq. Under the contract in a DOD notice, OSI's Rapiscan Systems Inc. to provide 80 of its Eagle M60 Mobile Cargo Inspection System vehicles and related training, spare parts, service and logistics support for Iraq. Rapiscan Rapiscan Eagle M60 Mobile Cargo Inspection System vehicles should provide valuable counter-terror service applications, particularly in the use of detecting VBIEDs. About time! These will be used by law enforcement, customs, and border protection.